Summary: This lesson is a synoptic resource suitable for Biology A Level (KS5), ideal for end-of-term revision lessons. It starts with the phenomenon of human skin colour, the advantages and disadvantages of dark and light skin, which may explain why they are distributed differently across the globe. By identifying melanin as the pigment reponsible, the lesson raises the question how such complex organic molecules can be produced, leading over to enzymes, and enzymatic/metabolic pathways. Fundamental principles of these pathways are explained, and then Drosophila eye pigmentation is introduced as an example to illustrate how genetics and biochemistry are used in combination to unravel metabolic pathways. For this, pupils are given chromatography results of normal and mutant flies which display changes in their eye colours and work out the enzymes affected by the respective mutations. This understanding is then related back to the initial question of human skin pigmentation: (1) first comparing and contrasting metabolic pathways of fly eye and human skin pigment, then (2) understanding how skin tone can be changed as the outcome of genetic alterations of the metabolic pathway and, eventually, (3) how evolutionary selection processes can explain the different distribution of skin colour across the globe. This resource is accompanied by a worksheet for the chromatography analysis and a homework task recapitulating some areas of the lesson and beyond, but also helping students revise and consolidate knowledge from several areas. 1. Why are there different skin tones in humans? Across the globe there is a high degree of difference in skin tones: Scandinavian countries in the north have a large proportion of people with lighter skin tones, countries closer to the equator with darker skin tones (Relethford, 1997). This geographical distribution is caused by evolutionary selection based on risk and benefit (Fig. 1). Dark skin protects against the ultraviolet (UV; in particular UV-B) component of the sun light, which causes DNA damage and mutations in skin cells leading to skin cancer (Narayanan et al, 2010). Lighter skin does not provide this protection; therefore, people with this skin tone have a higher chance of skin dmage such as sunburn and are advised to use sun cream with a safe sun protection factor (SPF: a relative measure of how long a sunscreen will protect you from UV-B rays). On the other hand, sunlight promotes the synthesis of vitamin D, and in northern countries with less sunlight (hence reduced risk of skin cancer) it is therefore of benefit to have light skin. Vitamin D is important for calcium and phosphate absorption in the gut required for bone strength (Nair and Maseeh, 2012), and its deficiency can lead to rickets (a disease where bones become soft and malformed, often characterised by bow legs). Modern fortification of foods has reduced the number of people affected by rickets, but finding the right balance for sun exposure seems important. Figure 1. 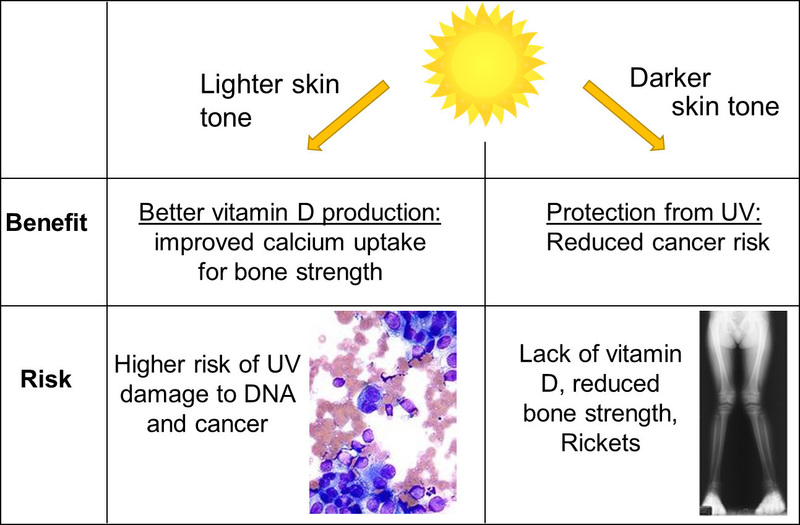 Risks and benefits of the UV-B component of the sunlight balanced out by dark versus light skin. 2. What is skin pigmentation? Pigments are molecules that absorb light; non-absorbed light is reflected and determines the pigments’ colour (see our light resource). The pigment primarily determining for our hair and skin colour is melanin. It is a polymer derived from the amino acid tyrosine (Fig. 2), but it is not a protein produced through ribosomal translation, but it is the product of a series of enzymatic reactions, referred to as a metabolic pathway. Here we will briefly explain the principles of enzymes and metabolic pathways: (1) the “one gene-one enzyme” hypothesis, (2) the “lock-and-key” and “induced-fit” models, (3) co-factors, (4) feedback inhibition and (5) different forms of metabolic pathways. Figure 3.Genes encode enzymes (green) or specific subunits of enzymes (not shown). 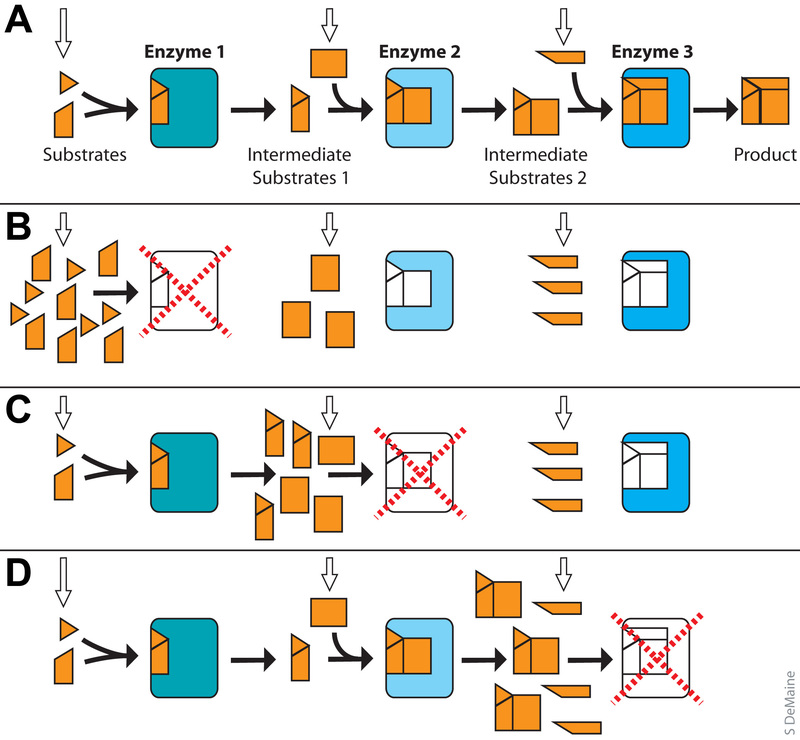 Enzymes display pockets that precisely match the shapes of their substrates (orange). After the enzymatic reaction (here a binding reaction of the two molecules) the product is released. (1) “One-gene-one-enzyme hypothesis” (Fig. 3): Enzymes are proteins encoded by genes which speed up (catalyse) chemical reactions. The “one gene-one-enzyme” hypothesis proposed by Beadle and Tatum (1941) stated that one gene codes for one enzyme and therefore each step in a metabolic pathway is controlled by a single gene. When it was recognised that enzymes can be complexes composed of different subunits, each encoded by a different gene, the hypothesis was renamed into the “one-gene-one-polypeptide” theory. (2) “lock-and-key” or “induced-fit model” (Fig. 3) [LINK]: Substrates fit into the active site of an enzyme like “lock-and-key” which induces a shape change, so that they form a very tight enzyme-substrate complex (“induced-fit”) which lowers the activation energy for the enzymatic reaction. After this reaction, the product(s) is/are released and the enzyme is able to repeat the process. (3) Co-factors: many enzymes use “helper molecules” that assist in biochemical transformations. Co-factors are either linked to the enzyme (they bind ‘covalently’) and are then referred to as ‘prosthetic group‘. If they bind only transiently during the catalytic process, they are referred to as ‘co-substrates‘. Co-factors are either metallic ions, or they are organic molecules (e.g. made from vitamins), but NOT proteins made from ribosomal translation; such organic co-factors are also called ‘co-enzymes‘. All have the same function of facilitating the enzymatic reaction: an inactive enzyme without the co-factor is called an ‘apoenzyme‘ and the complete enzyme with co-factor a ‘holoenzyme‘. (4) Feedback inhibition (Fig. 4): It is important to have some control over reactions in the body, for example to prevent that all substrate is being used up when there is no actual need for the product. For this, enzymes can be activated or inhibited. For example, competitive inhibitors are molecules similar to the substrate which bind to and block the enzyme’s active site; in contrast, non-competitive/allosteric inhibitors bind somewhere else on an enzyme and change its shape so that the active site no longer binds the substrate. In feedback inhibition, the substrate itself acts as an inhibitor of the enzyme it produces, usually through allosteric inhibition. This regulation can be concentration-dependent: if the product is not used up and accumulates in the cell, it is more likely to bind and inhibit the enzyme, thus preventing further accumulation. Figure 4. If too much product accumulates, this may lead to feedback inhibition. (5) Different forms of metabolic pathways (Fig. 5): Different metabolic pathways can be used to break a product down (catabolism) or to build up a new molecule (anabolism). They often involve several steps, each catalysed by a different enzyme, modifying the molecule in a stepwise manner (Fig. 5). In nature, metabolic pathways can be extremely complex involving many enzymes, substrates and co-factors. 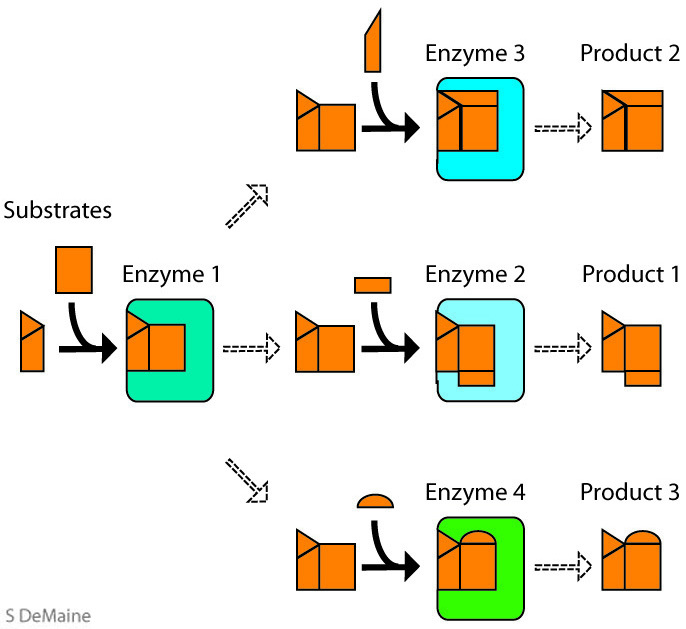 Apart from having multiple steps, metabolic pathways can also be branched whereby one common intermediate substrate is used by different enzymes to produce different products (Fig. 6). Figure 5. Exemplary metabolic pathway with several steps forming an anabolic pathway: Enzyme 1 catalyses the joining of the initial substrates to form a product which is the first intermediate substrate for Enzyme 2, the product of which forms the 2nd intermediate substrate for Enzyme 3 which, in turn, generates the final product. Below some exemplary intermediate steps of the Melanin pathway are given which is even more complex in reality. Figure 6. In a branched metabolic pathway multiple products can produced from one common precursor. In this example Enzyme 1 produces a product which can be used as a substrate for 3 different enzymes to produce distinct products. How can we study metabolic pathways? The key strategy is to take random approaches to block single enzymes (without knowing which one! ), and then to measure whether any substrates/products of interest either accumulate or vanish (Fig. 7). If the attempt worked and different enzymes within the same pathway were blocked in different experiments (Fig. 7), one can then deduce the sequence of enzymatic steps (i.e. which molecule are precursor and which are derivatives) and identify what enzymes act at what step in the process. Enzymes can be blocked using pharmacology or genetics. The pharmacological approach uses so called drug screens using random chemical substances (referred to as ‘drugs’) which are derived for example from tropical plants or random synthesis in laboratories. These drugs are added one-by-one to cells, in the hope that they cause quantitative changes in substrate/products of the pathway in question; such drugs are then further scrutinised. The genetic approach takes advantage of the fact that enzymes are encoded by genes which can be affected by mutations. Therefore, in analogy to drug screens, gene mutations are randomly induced (e.g. using radiation or chemical substances that induce mutations, hence also cancer!). If a mutation causes changes in substrate/product amounts, this mutation is then further scrutinised; if the gene affected by the mutation can be identified, it leads directly to the amino acid sequence of the enzyme! Figure 7. When blocking enzymes, their substrates are likely to accumulate (unless used up by other enzymes in a branched metabolic pathway; Fig. 6), and their products are reduced or missing. Open arrows indicate that molecules come in from other pathways or sources. The fruit fly Drosophila has red compound eyes, primarily determined by two types of pigments: brown ommochromes are found in primary and secondary pigment cells, and red pteridines are found in secondary pigment cells (Fig. 8; Shoup, 1966). Figure 8. 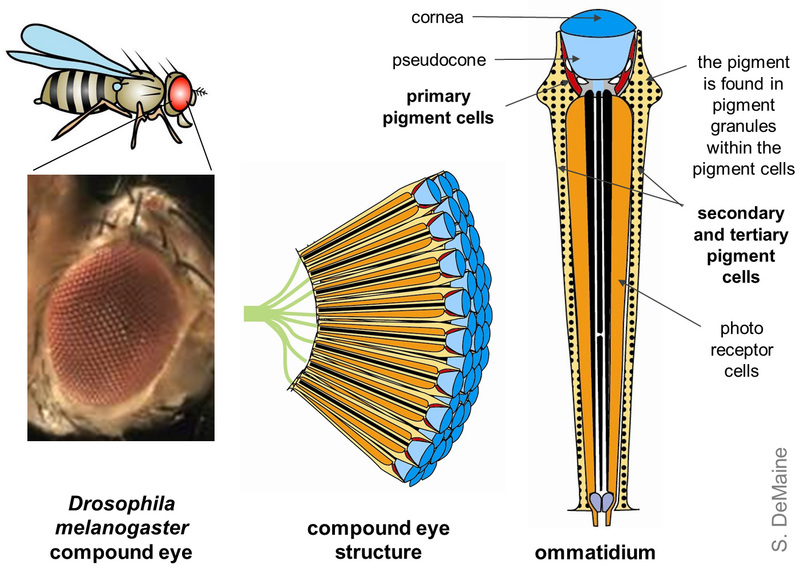 The Drosophila compound eye (shown on the left), is composed of single units called ommatidia (middle), each composed of 8 photoreceptor cells (only some shown) and support cells ensheathing the ommatidum and forming its lens system (cornea, pseudocone). The primary and secondary pigment cells contain specialised organelles, the lysosome-like pigment granules, which contain the enzymes to produce pigment: ommochromes are brown pigments in primary pigment cells and pteridines are red pigments in secondary pigment cells. Both ommochromes and pteridines have their discrete metabolic pathways within the pigment granules, and the primary substrates (GTP for pteridines and tryptophan for ommochromes) are transferred into the granules via distinct transporter proteins composed of different subunits, one of which is common to both transporters (Fig. 9). Like enzymes, also the transporters are therefore essential for pigment production (see examples in Fig. 9). Affecting both transporters causes absence of eye colour, which is the famous white mutation discovered in 1910 (see the film; Mackenzie et al, 1999; Cagan and Ready, 1989). Figure 9. Importance for precursor import for pigment production (click image to enlarge). A) Two distinct transporters sharing one subunit (2) import Tryptophan, the precursor for Ommochrome (brown pigment), and GTP, the precursor for Pteridine (scarlet pigment). Metabolic pathways in these granules produce the respective pigments which add up to the brownish red eye colour of fruit flies. B) Deleting the scarlet gene affects the Tryptophan import and abolishes the brown pigment, hence eyes become scarlet red. C) Deleting the brown gene affects GTP import thus abolishing the red pigment and causing eyes to look brown. Here we will focus on Pteridines which, themselves, represent a cocktail of pigments and provide a nice example of a branched metabolic pathway (Fig. 10). Amongst the Pteridines, a group of red pigments called Drosopterins are the essential fraction contributing to eye colour whereas Sepiapterin is visible as yellow in visible light, and Biopterin is only visible in UV light. This is still a simplified version of all molecules derived from this pathway, but sufficient to explain the principles of analysis. Figure 10. The Pteridines are derived from GTP as their common precursor and form a branched metabolic pathway giving rise to a number of pigments. As explained in section 4, metabolic pathway can be “deciphered” using mutations of genes encoding enzymes, in combination with measurements of their substrates/products. Two potential ways to measure substrates/products are the eye colour of flies (Fig. 12) and chromatography. There are many sophisticated ways of chromatography, such as thin layer chromatography, gas-liquid chromatography and ion exchange chromatography, but the simplest form that can be used, also in classrooms, is paper chromatography (Figs. 11 and 12). Figure 11. The principle of paper chromatography. Chromatography paper is prepared by drawing a pencil line approx. 1 cm from the bottom of the paper; ~5 fly heads are crushed and transferred as a dot to the middle of the pencil line; the chromatography paper is placed in a sealed vial containing a solvent (a 1:1 mix of propan-2-ol and ammonium hydroxide) not reaching higher than 2-3 mm below the pencil line. The tube is covered with foil (to prevent light-induced break-down of the pigments) and left for 2.5 hrs (Ranmuson et al., 1960). 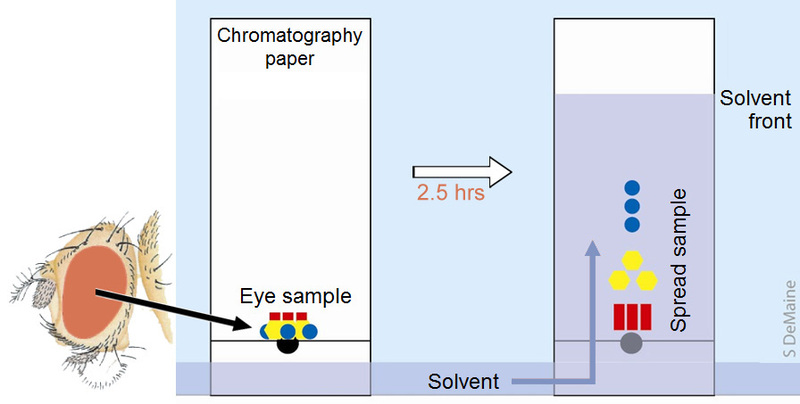 The solvent climbs up the chromatography paper, taking with it and separating the eye pigments. The molecules separate out because they have different degrees to which they dissolve in the solvent (mobile phase) and/or interact with the paper (stationary phase). The retardation factor Rf for each pigment spot is calculated by dividing the furthest distance travelled by each pigment (measured from the pencil line) through the distance the solvent has travelled (i.e. distance from pencil line to solvent front). Once calculated this value can be compared to the reference list of Drosophila pigments (see the teaching resource documents) to identify the respective pigment. Figure 12 shows some experimental results when removing the transporter genes brown, scarlet and white, as well as the sepia gene coding for an important enzyme of the Drosopterin pathway. The combination of eye colour changes and chromatography data makes it possible to take apart the metabolic pathways step by step. Figure 12. “Deciphering” the Drosophila metabolic pathway of Pteridines. A) The same pathway as shown in Fig. 10, but some genes are indicated (highlighted in yellow) which encode transporter proteins (brown, scarlet, white) or an enzyme for Drosopterin production (sepia, encoding “PDA synthase”). B) Chromatography using heads of flies as explained in Fig. 10, and documented under ultra violet (UV) light: heads of normal flies (wt, wildtype) show three pigments, as indicated by numbers in green circles; if the sepia (se) gene is mutated, spot 2 is missing; loss of the white gene (w; required for GTP and Tryptophan transport, A) or of the brown gene (bw; required for GTP import, A) cause a loss of all spots, whereas loss of the scarlet gene (st; loss of Tryptophan import, A) leaves all spots intact. C) Eye colours of the same fly strains used for chromatorgraphy in B: If abolishing import of GTP and Tryptophan (w mutation) eyes have no colour; if abolishing only Tryptophan import (st mutation) the brown pigments are missing and the remaining red Pteridins (see B) cause the scarlet eye colour; if abolishing only GTP import (bw mutation) all red pigments are missing (see B) and eyes appear brown from the remaining Ommochromes); if removing only Drosopterin (se mutation), the remaining Pteridins together with the Ommochromes produce a darker brown; eye images taken with permission from Chyb & Gompel, 2013. 6. What mechanisms explain the north-south distribution in skin colour? The skin is formed of an upper pigmented layer, the epidermis, and a lower layer, the dermis (see here an image of the skin). As mentioned in Section 2, the pigment in the epidermis is Melanin. Melanin is produced in pigment granules called melanosomes, produced in specialised skin cells called melanocytes in the lower layers of the epidermis. Melanosomes are ‘pinched off’ from melanocytes and ‘taken up’ by the keratinocytes (the actual cells forming the epidermis), and this process is referred to as phagocytosis. 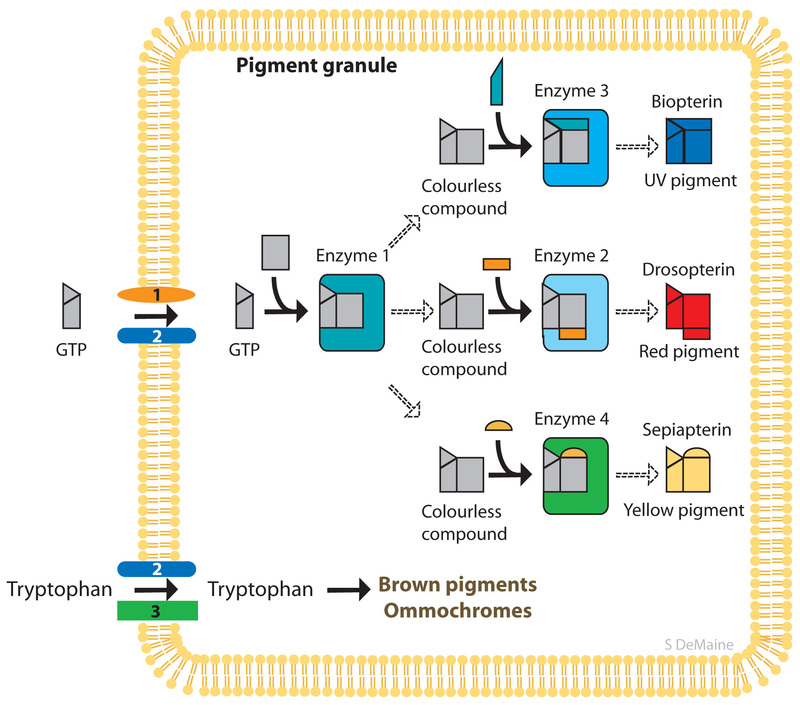 There are two types of Melanin in human skin, Eumelanin (brown or black) and Pheomelanin (yellow or red); these pigments are derived from a branched metabolic pathway using Tyrosine as the common precursor (Fig. 13). For more detail click here or read Yamaguchi et al. (2000). Figure 13. The metabolic pathway producing Pheo- and Eumelanin. A) The common precursor is Tyrosine and its derivative DOPA from where the pathway branches. B) The difference in skin colour is determined by the amount of Eumelanin produced. Skin colour is determined by the amount of Eumelanin: the higher the content the darker the skin. However, how can this be achieved? The Melanocortin receptor 1 (MC1R) is a protein in the membrane of melanocytes (Fig. 14). It is a so-called receptor molecule which can bind specific factors on the outside and, upon binding, trigger changes in the inside of the cell. As shown in Figure 13, MC1R is activated by melanocyte-stimulating hormone (MSH), but it is down-regulated by another hormone called Agouti signalling peptide (ASIP). Activated MC1R triggers the activity of factors in the cells that lead to the production of Eumelanin (Fig. 14); this may occur through enhancing the production of enzymes of the Eumelanin pathway (Fig. 13; e.g. by stimulating gene transcription) or through activating these enzymes themselves [see Section 3 (4)]. From the information above, we can conclude that a person with dark skin is likely to have high MSH levels (stimulating Eumelanin production), and a person with light skin to have low MSH and/or high ASIP levels (turning down Eumelanin production); a person with red hair and even lighter skin is likely to carry a mutation in the MC1R gene, thus having an even stronger balance shift from Eumelanin to Pheomelanin (Fig. 14). Some people have a condition called albinism in which Melanin is entirely absent, for example due to the absence of Tyrosinase or a Tyrosine importer (see Fig. 13). Accordingly, albinism is characterised by white skin and hair and often also red eyes (because lack of melanin pigment in the eye lets us see through to the highly innervated retina). Figure 14. 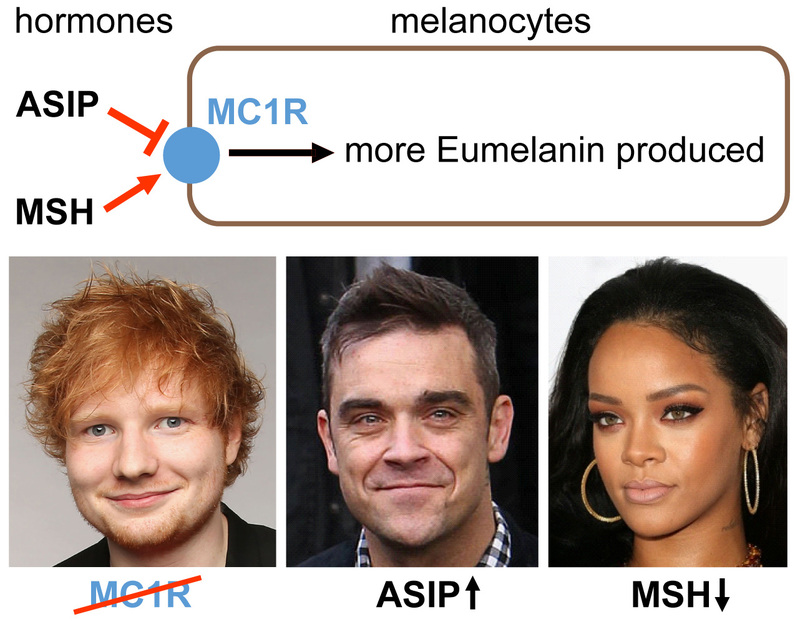 The MC1R receptor protein promotes Eumelanin production. It is hormonally regulated: activated by MSH and inhibited by its “antagonist” ADIP. Usually, these factors can explain different skin colours. Humans are believed to have originated in Africa (Fig. 15; although this has recently been questioned: LINK). Therefore, high levels of MSH and darker skin were likely traits that were positively selected because they protect from skin cancer (Fig. 1). When humans migrated north, the selection criteria shifted towards lighter skin, especially since nutrition will not have been optimal to prevent Rickets (Fig. 1). Therefore, one can imagine that mild genetic mutations (referred to as genetic variations) were selected for which would reduce MSH expression, increase ASIP or reduce (but not abolish) MC1R activity, thus still leaving the flexible option of gaining tan in summer. In the grey and cloudy north even mutations in the MC1R gene were tolerated, in spite of the fact that the ability to tan is severely reduced. Figure 15. Speculations about the evolution of skin colour. There is one exception to this trend: indigenous peoples who live near the poles have darker skin although there is low UV irradiation (due to low solar elevation and high ozone content absorbing the UV). However, these populations do not suffer from the expected lack of vitamin D (Fig. 1) because they supplement it from their fish-rich diet. In recent years there has been a higher incidence of vitamin D deficiency due to changes in diet (Sharma et al, 2011). Note that recent research has shown that the simple model explained above is more complicated and involves more genes than originally thought (The Atlantic, 2017). Future versions of this website will have to include those ideas once deeper understanding has been achieved.